Bishop Frank J. Dewane of Venice and Msgr. 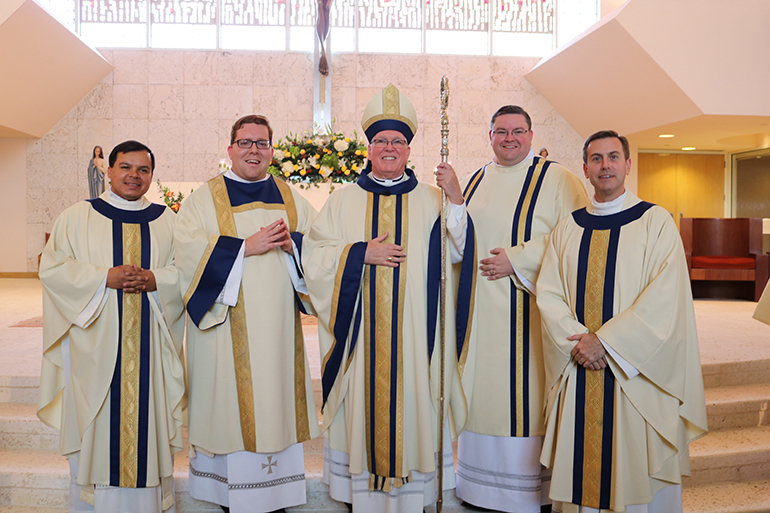 David Toups, far right, rector of St. Vincent de Paul Regional Seminary in Boynton Beach, pose with Father Elvis Gonzalez, far left, Archdiocese of Miami vocations director, after ordination of the archdiocese's new transitional deacons, Andrew Tomonto (second from left) and Ryan Saunders (second from right.) The seminarians were ordained April 6 at St. Joan of Arch Church in Boca Raton, part of a class of 15 currently studying for the priesthood at the seminary. BOCA RATON | Ryan Saunders of St. Anthony Parish in Fort Lauderdale and Andrew Tomonto of St. Louis Parish in Pinecrest were ordained transitional deacons for the Archdiocese of Miami April 6, one of the final steps of their journey to priesthood. Venice Bishop Frank Dewane celebrated the Mass and ordained the men, along with 13 others also completing their studies for the priesthood at St. Vincent de Paul Regional Seminary in Boynton Beach. The transitional deacons will spend the next year completing the last of their academic courses while working weekends as deacons in a parish to which Archbishop Thomas Wenski will assign them.